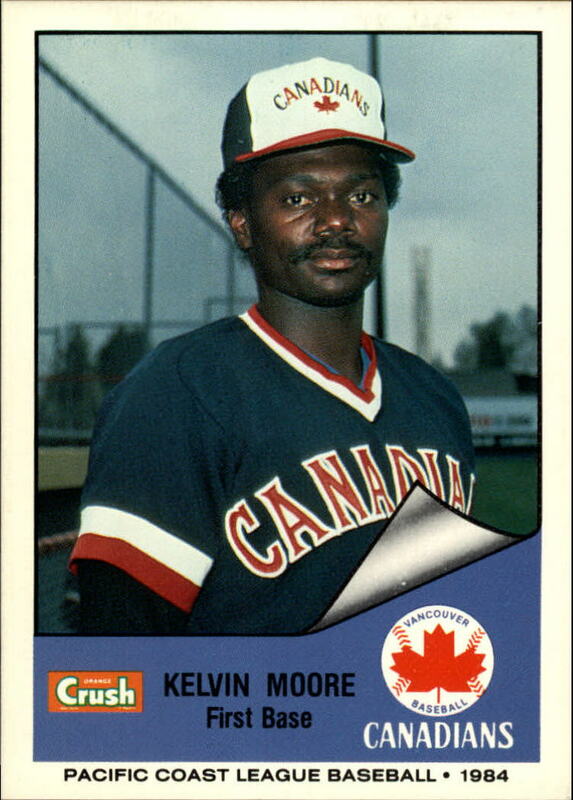 Kelvin Moore, who played 58 games with the Vancouver Canadians in 1984, passed away on November 9 at age of 57. • Sudbury, Ont., native Farhan Zaidi was named the general manager of the Los Angeles Dodgers last week to become the sixth Canadian to be named a big league GM. The others are George Selkirk (Huntsville, Ont., Washington Senators, 1964 to 1969), Murray Cook (Sackville, N.B., New York Yankees, 1983; Montreal Expos, 1984 to 1987; Cincinnati Reds, 1988, 1989), Gord Ash (Toronto, Ont., Toronto Blue Jays, 1995 to 2001), Doug Melvin (Chatham, Ont., Texas Rangers, 1994 to 2001; Milwaukee Brewers, 2003 to present) and Alex Anthopoulos (Montreal, Que., Toronto Blue Jays, 2009 to present). With Zaidi’s appointment, this represents the first time in major league history that three Canadians have been big league general managers at the same time. • The 2014 Major League Baseball awards may be handed out, but stay tuned over the next few weeks to find out who will win the Canadian Baseball Hall of Fame’s annual accolades. The recipient of the Hall’s Jack Graney Award, which is presented to a member of the media who has made significant contributions to baseball in Canada through their life’s work, will be announced first, followed by the Tip O’Neill Award, which is given out to the top Canadian player each year. Stay tuned to baseballhalloffame.ca for more information. • It used to be that when a player was traded a few of his new teammates might call him to welcome him, but today, players are more likely to be welcomed via Twitter. When second base prospect Devon Travis was acquired by the Toronto Blue Jays for Anthony Gose on Wednesday, young Blue Jays pitchers Aaron Sanchez and Marcus Stroman welcomed him via Twitter. The 23-year-old Travis appears to be the Blue Jays second baseman of the future. Ben Nicholson-Smith of Sportsnet provided an extensive breakdown of Travis’s skill set in this article. • The late Ron Stead, an Ontario Intercounty League pitching legend, was inducted into the Baseball Ontario Hall of Fame in a ceremony last night. Stead, who passed away on December 5, 2011, owns almost every pitching record in Intercounty League history. He’s also the only player that has been elected to the Canadian Baseball Hall of Fame based on their amateur playing record. For more information about last night’s induction festivities, you can read Dan Haugh’s excellent Canadian Baseball Network article. • Condolences go out to the family of former Vancouver Canadians first baseman Kelvin Moore, who passed away last Sunday at the age of 57 after suffering a heart attack at his home in Covington, Ga. Reports indicate that he had been battling multiple illnesses, including diabetes, in recent years. The 6-foot-1, 195-pound infielder hit .221 in 58 games with the Triple-A Canadians in 1984, after suiting up for parts of three big league seasons with the Oakland A’s from 1981 to 1983. In all, Moore played for parts of eight seasons in professional baseball in the A’s, Mets, Brewers and White Sox organizations. He’s survived by his wife, Patricia, two daughters and one son. You can read his obituary and leave condolences here. • It was 16 years ago today that Roger Clemens won his second consecutive American League Cy Young Award with the Toronto Blue Jays. For the second straight season, he also captured the American League pitching Triple Crown by leading the circuit in wins (20), strikeouts (271) and ERA (2.65). Shortly after collecting the award, Clemens requested a trade as part of a verbal agreement he had with the Blue Jays’ front office. But it wasn’t until February 18, 1999 that Jays GM Gord Ash was able to deal Clemens to the New York Yankees for David Wells, Homer Bush and Graeme Lloyd. • Just a reminder that the Canadian Baseball Hall of Fame’s annual Christmas Silent Auction is now underway. There are lots of great autographed items to bid on. You can check out what’s up for grabs here. • Here’s this week’s trivia question: Who was the first Toronto Blue Jays player to receive a vote in the American League MVP voting? The first person to provide the correct answer in the “Comments” section below will win an autographed Jimmy Key baseball card. Looks like Travis is a good pickup, but single A and double A is not major league pitching. Hope he does well, but he should not see MLB pitching this yearâ, at all. Thanks for the comment, Devon. I agree with you to a certain extent, but he’s going to be 24 soon. I could see him getting some semi-regular big league at bats by the end of the 2015 season. You are correct Len. Stieb had one MVP vote in 1981. I’ll get the Key card in the mail to you shortly. Congrat’s to the Stead family on his Induction into the Ontario Baseball Hall of Fame. 10% of the GM’s in MLB are Canadian! WOW, that’s great. Thanks for the comment, Scott. Yeah, that’s an impressive percentage of Canadian GMs. I was very happy for the Stead family as well. Keep up the good work Kevin.Really enjoy reading your info.